We are writing to you to ask for your help in purchasing an ultrasound system for the clinic and the Emergency department here at the Milk River Health Center. Mark Simons and I have completed an EDE (Emergency Department Echo) course which will allow us to be certified in EDE echosonography. This is basically a point of contact diagnosis with an ultrasound system. This equipment will increase quality of care for our community in a timely manner. Point of care contact will enhance early detection of diagnoses; for example 79% of students can detect fluid around the heart with this equipment where only 49% of seasoned cardiologists can detect fluid with a stethoscope. The fluid around the heart has to be 100ml for a physician to detect with a stethoscope and this equipment can detect 20ml around the heart allowing much earlier intervention and potential improved patient outcomes. These are two of many examples this system can benefit our geographic community. This system will be portable and allow us to use it both in the clinic and the emergency department. A huge benefit for our patients of all ages, saving emergency trips to Lethbridge for tests, we will be able to start helping patients immediately. Also giving us the ability to have diagnoses to send with patients to specialist as well as further testing. Your help in purchasing this equipment would be a great asset to our community’s health. The cost of this equipment is $50,000.00; any help you can give us would be greatly appreciated. TWO FLEXIBLE USE OBSERVATION BEDS FOR MILK RIVER HEALTH CENTRE! Milk River Health Centre’s two new Flexible Use Observation Beds are under construction and will be completed early in 2019! These Beds will be under the control of the physicians. Dr. Ada Ifebuzor has completed her 3 year contract with Alberta Health Services as a Family Physician. Thank you for your care of the folks of our communities and wish you and your family the best in the future! 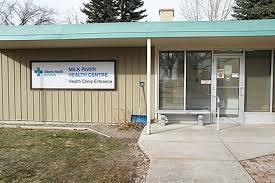 Milk River Health Centre is currently recruiting two physicians. MILK RIVER IS NOW RECRUITING TWO RURAL FAMILY PHYSICIANS! Visit Doctor Jobs Alberta, Alberta Health Services and APLJobs to find our postings for two rural family physicians for the Milk River Medical Clinic and Milk River Medical Centre! Thank You to our Healthcare Workers! On behalf of our communities Emma Hulit made cookies and delivered them to say a big THANK YOU to everyone who works in healthcare in our communities! We all appreciate our excellent and accessible health workforce close to home. 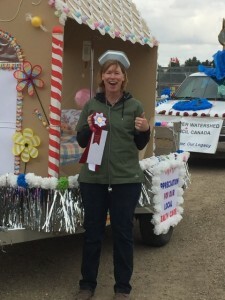 Emma is a volunteer member of Quad Municipality Healthcare Support Committee formerly called the Quad Municipality Physician Recruitment Committee and representing the communities of Warner, Coutts and Milk River and the southern portions of the Counties of Warner and Forty Mile. Emma is also a volunteer member of the Old Man River Health Advisory Council representing the South Zone of Alberta. Thank you to all who made the Strawberry Tea such a success! Many Thanks for your support and to all those who volunteered to help! Lethbridge Herald subscription for the residents. Donation to the Tree of Hope. Resident Family Council donations for entertainment events, picture frames for new pictures in the Health Centre and flowers for the garden. Christmas stockings for the residents of Long Term Care and patients in the CSB Beds and Emergency Department. Bingo prizes for Monday Bingo. Linens for the Laboratory Suite and the Doctor Suite. Giveaways for the Laboratory for children undergoing lab tests and procedures. 3 new television sets for the Community Support Rooms. Auxiliary members volunteer to help at the Centre when asked when asked by our Volunteer Coordinator Michelle Dube and by Sherry Laackmann from the Recreation Therapy Department. Olwen Green and Maggie Littau volunteer regularly at the popular and well attended Long Term Care Monday Night Bingo. On behalf of the residents and their families and the community – Thanks Olwen and Maggie! Our next Hospital Auxiliary Meeting is June 14 at 11:30 am at Yummy’s Restaurant. New members from all our communities are welcome! Welcome Scott MacCumber as the new Chairman of the Committee! Many Thanks to Amy Horgus, our outgoing Chairman! I feel we’ve had a successful year. 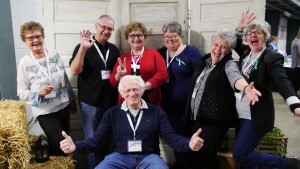 I was newly elected in April and in May we attended a board leadership conference in Lethbridge. I learned a lot I the sessions but learned the most by listening to others in our brainstorming sessions. We saw our Margaret McCanna retire from unit manager at the hospital and we welcomed Sivakumar Savudan as our new unit manager. We decided as a committee that our energies would not be focused on fund raising this year as we felt our current funds were sufficient but rather concentrate on other areas. We did enter the Bonanza Day Parade with the theme, “How sweet it is to celebrate our communities”. We won first place in our category. Our biggest event was our Skills Day that we hosted in October. 49 medical profession students attended our event. They attended skills at the hospital on Saturday. Experiencing and learning new skills from our Doctors, EMT’s, Nurses, Physiotherapy Dept, and our Physician Assistant. They then attended our community potluck and got to meet many of our community members. They were amazed at the food and what great cooks we had. They got to join us in honoring our retired health care workers. They then attended on of our many attractions “Creepy Hollow”. Sunday was a big day for our students as they travelled out to Paul and Marilyn Vornbrocks. They got the opportunity to travel to Doug and Audrey Turners to see the state of the art Quadrasizer that Ryan uses. Paul and Marilyn served our students a delicious lunch, where they got to experience a wild game feed. It was a very successful event and we got great feedback from all the students. Some students were so impressed with our small community that they were expressing interest not only in our community but other small communities. Our team got the opportunity to brainstorm with Dr. Ada via tele-conference on ways to increase Dr. patient panels. Fuller patient panels lead to increased opportunity for another Physican. We also have decided that a name change was in order as we have not been involved in active recruiting for some time. Our position is more on of support, attraction and retention. We are no longer the Quad Municipality Physicians Recruitment Committee but are the Quad Municipality Healthcare Support Committee. We feel this will be a very good change for us. Also, much less confusing for others. Our monthly meeting minutes are now available in our community newsletters. I’d like to encourage everyone to attend the community potluck on Thursday as we will be showcasing our volunteer organizations. Love Activities? We’ve got you covered! The Milk River Health Centre needs volunteers to support residents in Therapeutic Recreation programs and other leisure activities. This is a great opportunity for anyone who likes volunteering with the elderly. In this role, volunteers genuinely impact the resident’s quality of life by leading or helping with activities like birthday parties, singing, decorating the facility, playing games, or taking them for short walks. For more information, call 403.345.7003 or 403.223.7212. Oldman River Health Advisory Council 2018. Emma Hulit from Milk River is our representative on the Health Advisory Council. Milk River Medical Clinic is Accepting New Patients! 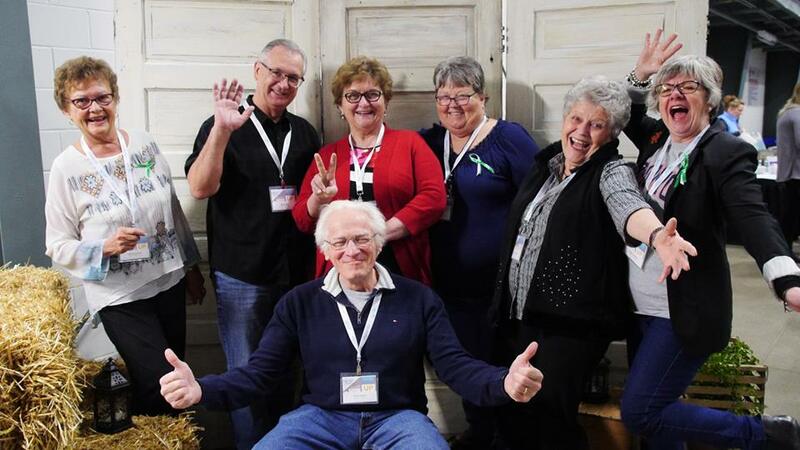 Community Potluck Supper for Non-Profits March 8, 2018. Amy welcomes volunteers to the Quad Municipality Healthcare Support Committee. Join us at the AGM on March 6 at the Milk River Town Hall Council Chambers at 7:00 pm. New members welcomed! Visitors are Welcome to attend the Quad Municipality Health Professional Attraction and Retention Committee Meeting December 5, Coutts Recreation Hall at 7:00 pm. 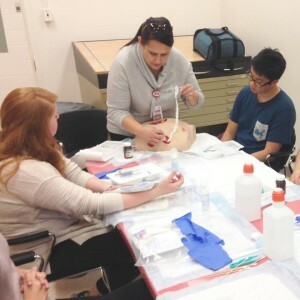 Milk River Skills Weekend Triggers Interest in Rural Health Careers. Lorelee Kemble, an RN at Milk River Health Centre, instructs wound care at a Skills day in Milk River hosted by RhPAP. October RhPAP Skills Weekend will introduce post-secondary students to rural health care and lifestyles. Future healthcare professionals are coming to Milk River to discover the advantages of living and working in a rural Alberta community. On October 27-29, 2017 the southern Alberta town of Milk River will host up to 50 post-secondary students studying several healthcare disciplines—including medicine, nursing, and physiotherapy—at a weekend Medical Skills event sponsored by the Rural Health Professions Action Plan (RhPAP), Alberta Health Services, and the Quad Municipalities Physician Recruitment and Retention Committee, representing the communities of Coutts, Warner, Milk River and the Counties of Forty Mile and Warner. Local health care professionals from Milk River Health Centre will introduce participants to the broad range of skills health professionals in rural communities are expected to use every day, including suturing, casting, and intravenous (IV) starts. RPAP Skills events provide rural Alberta communities with a unique opportunity to make a positive impression on future healthcare professionals through showcasing local amenities and attractions. 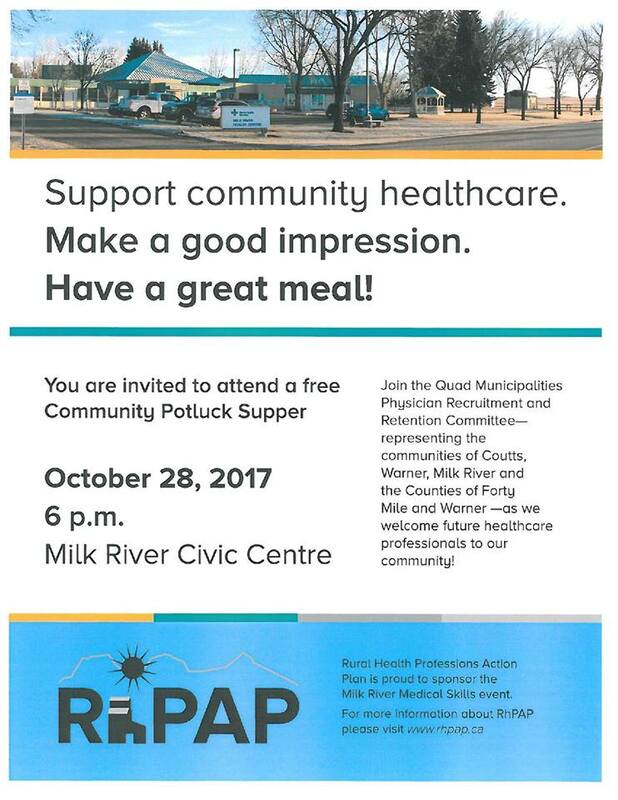 Students will experience the best of local hospitality at a community potluck supper to take place at the Milk River Civic Center at 6 p.m., October 28. 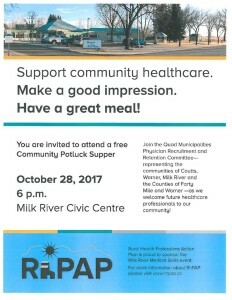 Community members are encouraged to come out to the pot luck to meet the students and welcome them to Milk River. Skills events, including Skills Days and Skills Weekends, are sponsored by the Rural Health Professions Action Plan, and are scheduled in rural Alberta communities throughout the year by the RhPAP Health Professions Students’ Initiatives Coordinator. Visit www.rhpap.ca/skillsweekends to learn more about RhPAP Skills events. Two Flexible Use Observation Beds to be Added in Milk River! Just in case you did not hear, we have been approved for two beds to be opened in our hospital. These beds are “Flexible Observation Beds” and will be under the control of the doctors and the Health Centre. This is great news for our citizens. First place ribbon at the Bonanza Day Parade! Well done Amy! (Quad Municipality Physician Recruitment and Retention Committee). 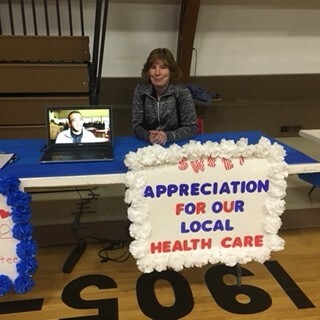 Amy Horgus, Chairman of the Quad Municipality Physician Recruitment and Retention Committee representing the communities of Warner, Coutts and Milk River and the southern portions of the Counties of Forty Mile and Warner.